On September 30 at Naha District Court, the plaintiff group heading to the Naha District Court for the final hearing. On September 30, a trial hearing of a case involving 79 survivors and survival family members embroiled in the Battle of Okinawa has concluded at Naha District Court. 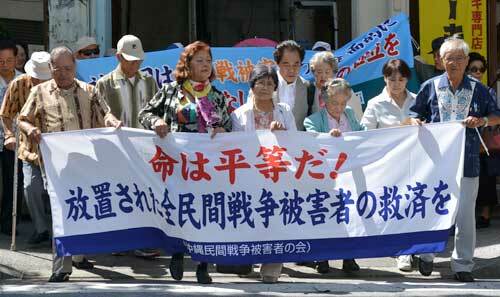 The plaintiffs filed for damages against the Japanese government. The decision will be given on March 16, 2016. Prior to the final defense plea, the plaintiffs handed over the medical certificates of 37 people, who were diagnosed with Post-Traumatic Stress Disorder (PTSD) and other psychiatric issues caused by war experiences, to the court. According to the lawyers, it is the first time in which war victims pursuing damages from the state have submitted medical certificates about psychological damage. The government claims that the war occurred when Okinawa was under the Meiji Constitution. On that basis, it rejects the plaintiffs’ argument and claims the state is exempt from responsibility for compensation. It also argues for ‘tolerance theory’ – the idea that the governed should equally tolerate damages caused during the war. At the final hearing, lead lawyer Shigeru Zukeyama stressed, “War damage is the biggest infringement of basic human rights.” Pointing out the particularity of the Battle of Okinawa, including atrocities by Japanese soldiers, Zukeyama counterargued that the Meiji Constitution also guaranteed protection of the lives and bodies of subjects.